In Darmstadt treffen sich Anwender, Entscheidungsträger und Partner aus den Bereichen Mechanik und Maschinenbau, Architektur und Bau sowie digitale Medien und Entertainment. Wir präsentieren eine interaktive Stingray Applikation in Kooperation mit der Hewlett-Packard GmbH. • Wo: Darmstadt. Sie finden uns am HP Stand. RTC 2015 Europe in Portugal, Oct 20. – 22. 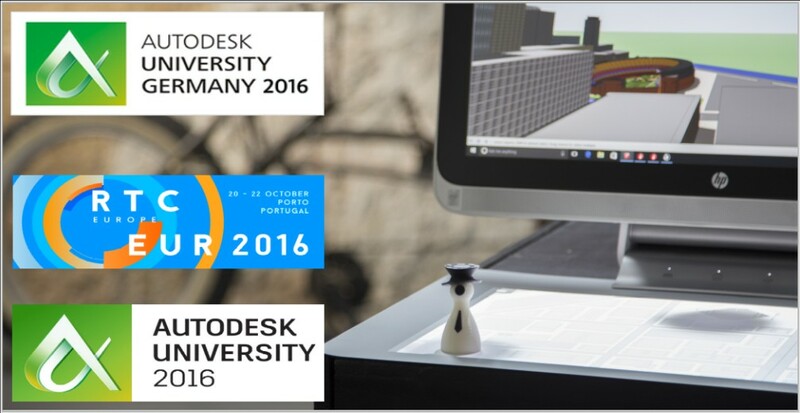 The conference that covers everything about Autodesk® Revit® and BIM. The conference will cover areas like how Revit and related applications drive ESD analysis, simulation, visualization and many more. Experience the powerful combination of edddison, Sprout by HP and the real-time visualization made with the Autodesk Stingray. A cooperation with Hewlett Packard inc.
• When: 20th – 22nd of October 2016. You will find us at he HP booth. “Shape the future. Be the change”. The Autodesk conference for those who design, build, make & create. Experience “edddison on Sprout”. The real-time visualization is made with the Autodesk Stingray engine. A cooperation with Hewlett Packard Inc.
• When: November 15th – 17th, 2016. Visit the HP booth and try out Stingray and edddison on a Sprout computer. • Where: Las Vegas at The Venetian. You will find us at he HP booth.